George Kosch dug right into the training this morning promptly at 9 AM ET. Full house today – lots of eager online entrepreneurs. Mental Shift: Being the list owner, being the seller, being the marketer, the one earning – INSTEAD of being the buyer! The potential to earn online is tremendous with thousands and thousands of affiliate programs, and "store sites" like Etsy, Shopify, JV Zoo, Amazon, E-Bay, ClickBank. No matter what affilate program you are involved with or what you are sellign you still need leads and you still need to know how to market. That’s what we teach you here at Worldprofit. Our unique, systematic training program teaches you how to generate sales as a Worldprofit Reseller but you can use the techniques, and the tools and reources in your member to generate leads and traffic for any and all your online programs – we encourage this! You learn this through this online bootcamp training lessons, currently over 125. Each lesson introduces you to important concepts, proven marketing techniques, specialized software and reputable resources that will help you grow your online business. 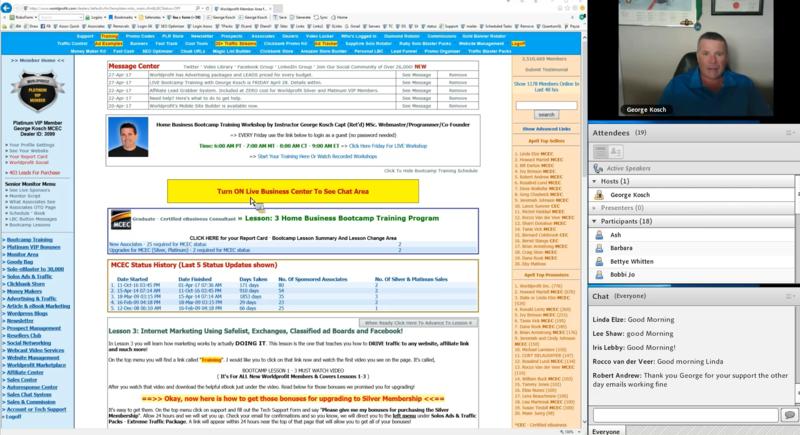 The weekly LIVE interactive training offered every Friday is available to all Members so you can ask questions, see demonstrations of how to do things. Your Worldprofit Website Management System ALSO includes your own blog (Blog Management System). Previous Article Worldprofit Bootcamp Update: It’s TRAINING Day. Will we see you there? Next Article Interview with George Kosch, CEO and Co-Founder, of Worldprofit Inc.